Samsung Honda's British Supersport contender Jason O'Halloran will make his Moto2 debut this weekend as a stand-in rider for the JiR Team at the British round of the championship at Silverstone. O'Halloran will act as substitute for JiR’s regular rider Mike di Meglio, who is out of action following a crash at Brno last weekend that left him with a compound fracture of the sacral bone. 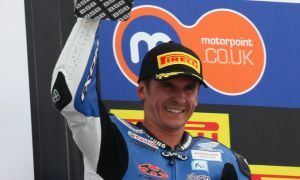 It will be O'Halloran's first time on a prototype Moto2 machine, but fresh off the back of a third-place finish with Samsung Honda at Cadwell Park on Monday - and with a good knowledge of the Silverstone circuit - the Australian rider is in high spirits and ready to take on the challenge. I'm really looking forward to the weekend. The Moto2 championship is a series I look up to and follow closely, so it will be an honour and a privilege to be part of it. Silverstone is a circuit I know well and I've had some good results there in the past. To be part of both the British Grand Prix experience and race with a very experienced team like JiR is going to be very special for me. It will be hard to predict any results just yet, as I've never even sat on a Moto2 machine, let alone ridden one, but I think coming from Supersport is probably easier than coming from the Superbike class. Either way, I'm coming to Silverstone this weekend off the back of two good results in British Supersport so my confidence is high and I’m looking forward to working with the team and learning the bike session by session.